In 1869, August Louis Ege (A.L. Ege) established a billiard table manufacturing business in St. Paul, Minnesota. An 1879 St. Paul city directory lists him as being located at 132 Sibley near the corner of Grand Avenue and Grotto. On January 6, 1904, A. Louis Ege, Carl L. Ege, and William B. Klein filed articles of incorporation at 218-220 East Seventh Street. A.L. Ege & Company was listed as dealers in billiard tables and billiard supplies with a capital stock of $25,000. Carl Ege was president. It appears that A.L. Ege was also a motorcycle enthusiast. The August 30, 1903 New York Times reported that he helped organize a motorcycle club in St. Paul and was its president. Tragically on April 5, 1905, a fire broke out in the basement of Ege's store destroying the building and its contents which threatened the entire block. The blaze was said to be one of the hardest the firemen had ever fought. Following the fire, little mention is made of the company in St. Paul newspapers which implies the company may have gone out of business. In January 1898, the partnership of Bernard Frank & Co. dissolved stemming from differences between Leo Frank and his partner William Bernard over a patent pertaining to "improvements in match safes." Bernard Frank & Co. dealt principally in "house furnishings and specialties." Immediately thereafter, Leo Frank and Israel De Keyser succeeded Bernard Frank & Co. The new partnership bought out Bernard's interest and the name was changed to Frank & De Keyser who continued as dealers in house furnishing goods and specialties. In 1912, the Frank and De Keyser entered into a disagreement and the two parted ways forcing the company into dissolution. De Keyser bought out Frank's interest and remained in business under the name De Keyser & Co.. Frank took up a temporary location at 32 Park Place "opposite the old store". 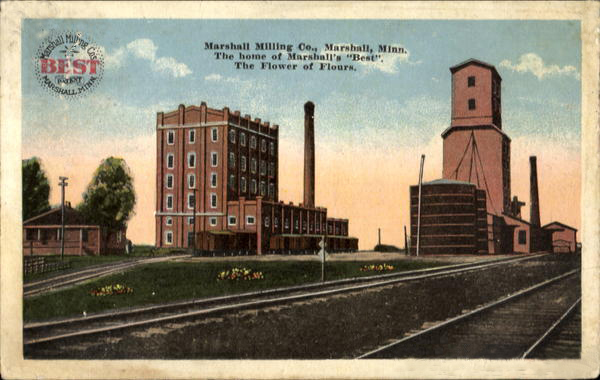 The Marshall Milling Company was a flour mill which produced Marshall's Best Flour. It was established during the late 1800s and was acquired by the Eagle Roller Mill Company in 1914. In 1877, Charles F. Monroe was hired as a decorator by the Meriden Flint Glass Co. Monroe's skill and imagination found him traveling abroad to study new designs and techniques of European glass manufacturers. In 1880, Monroe opened his first shop as a "European glass importer" in Meriden, Connecticut, at 36 West Main Street. In 1882, he began his decorating studio, and by 1885 had opened an art academy in Meriden, that became the C.F. Monroe Opal Glass Decorating Works the following year. The C.F. Monroe Co. was formally incorporated in 1892, and soon occupied several large buildings on the corner of West Main Street and Capitol Avenue. The company employed a number of fine artists such as Carl V. Helmschmied, Walter Nilson, J.J. Knoblauch, Joseph Hickish, Carl Puffee, Flora Fiest, Gustave Reinman, and others. 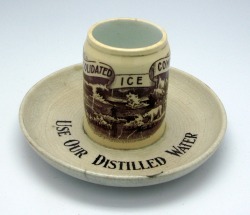 It did not manufacture its own glass, but brought in blanks from various American glass companies (quite possibly Fostoria or Westmoreland) and then decorated them. By 1916, the decorating company closed and Monroe became foreman for E. Miller & Co. Glass Works. In 1854, Lazarus Straus moved to Philadelphia with his three sons, Isidor, Oscar, and Nathan. Soon after the ending of the Civil War, Lazarus began importing cut glass from Bavaria. Once relocated to New York, his son Isidor joined him in 1865 and formed L. Straus & Son, importers of china, pottery, and glassware. In 1872, Nathan joined his brother and father and the name of the company was changed to L. Straus & Sons. Both Isidor and Nathan had also become employed with R.H. Macy & Company, in which L. Straus & Sons provided all the china and glassware. The company of L. Straus & Sons became the largest direct importers of china, pottery, & glassware by the 1880s. In 1876, Charles H. Werner established a business in the White's Opera House building, described as importers, jobbers, and brokers of crockery, glassware, fine china, lamp goods, Ohio stoneware, Bric-a-brac, silverware, and various other goods. The company employed 25 clerks and assistants and 4 active traveling salesman. 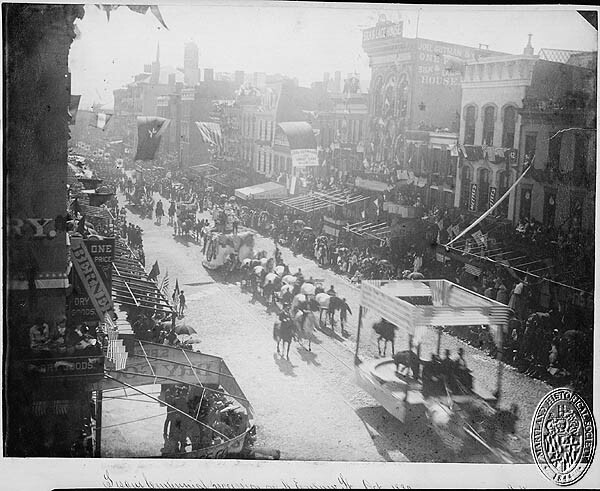 In 1886, Werner moved to a five story building on 15 and 17 Monroe Avenue following the "great fire" which destroyed the opera house. On August 17, 1898, articles of incorporation were filed in Detroit by Charles Werner & Sons at a new location; 253 and 255 Randolph Street. 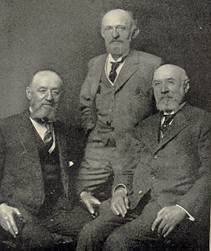 Shareholders in the company included Charles H. Werner, Charles Werner, Charles H. Werner Jr., Herman B. Werner, and Gertrude Werner. The company contracted with Spier & Rohns to construct a three story red brick building at the corner of Center and Randolph Street built at a cost of $12,000. In 1913, Werner built a four story building just to the north of his business and added a fourth floor to the original building. In 1923, Charles H. Werner Jr. sold the property comprised of the two buildings to Werner Land Company. It is unclear when Charles H. Werner & Sons discontinued business. 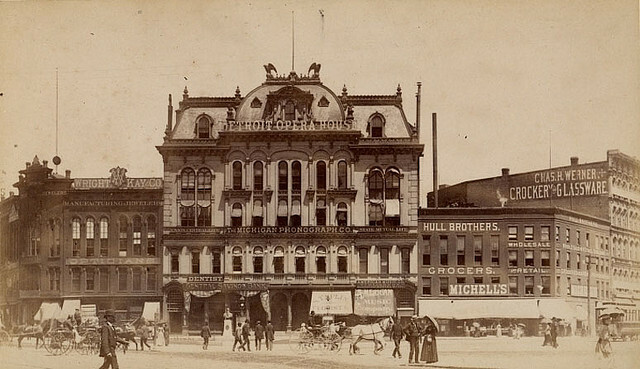 The Detroit Opera House in 1890. Werner's business can be seen to the right of the Opera House. In 1891, at 43 years of age, German-born Hugo Thuemler moved from his homeland of Germany to Pittsburg, PA (the city of Pittsburgh was spelled without the “h” from 1890 to 1911). Prior to his move, he had served in the Prussian army as lieutenant and made a Knight of the Iron Cross for bravery in the Franco-Prussian War. Once in the United States, he took up a job at the Rochester Tumbler Company where he remained and became its general manager through 1897. That year, he retired from the Rochester company and was looking to establish a similar plant in Wheeling, West Virginia. 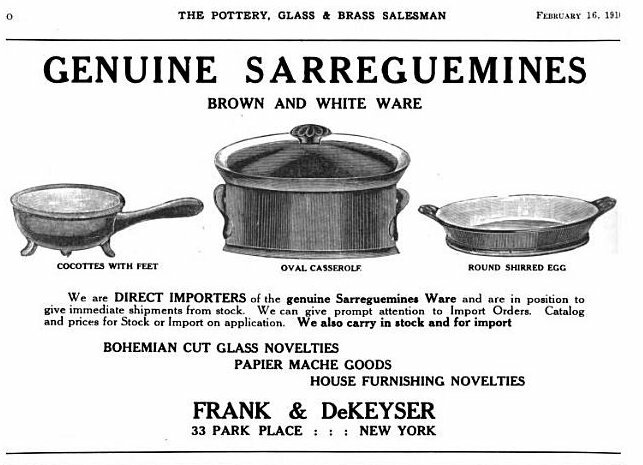 The 1897 Home Furnishing Review indicated Thuemler was "the originator of a new system of etching and decorating of glassware which is said to excel anything in that line." What became of the West Virginia plant is unknown. However, it is known that in 1898, he established his own company called the Thuemler Manufacturing Company in Rochester. It was described as “manufacturer of novelties, decorators of china and glassware.” Thuemler became a prolific producer of advertising and souvenir glasses, mugs and steins. In 1901, he relocated his firm to the Second National Bank building in suburban Sewickley, Pa. He also maintained a second address, most likely a sales office, at 1507 Liberty Avenue in Pittsburg. At this point Thuemler’s wares bear his “Pittsburg” pottery mark and the Rochester mark was dropped. Although the large majority of miniature mug match holders do not bear any manufacturer’s mark, a large number are attributed to Thuemler. In September 1903, tragedy struck when a large fire in Pittsburg consumed six large buildings and three dwellings. Thuemler's plant was one of those destroyed. Approximately 60 people were killed or injured in the blaze. In Sewickley, Thuemler was known to reside at the Elmhurst Inn, a former mansion which had been enlarged and converted to a boarding house and hotel. He and his wife Gertrude remained there until his death at the age of 61. Thuemler died at the Elmhurst Inn on September 1, 1908, a victim of “acute indigestion.” At the time, he was listed as president of the Thuemler Glass Manufacturing Company. Following his death, all references to the company disappear from Pittsburgh directories. 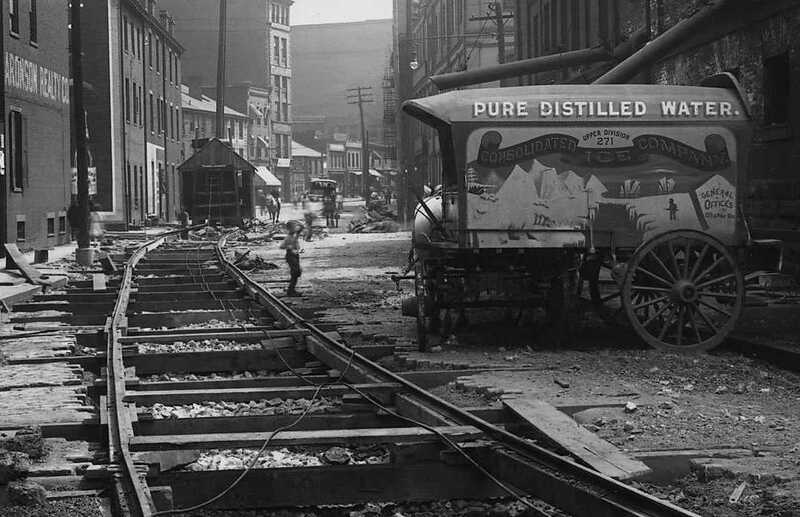 The Consolidated Ice Company of Pittsburgh, Pennsylvania is said to have been the first company to manufacture ice in Pittsburgh rather than ship it down by river from upstate New York and then storing for sale. Its logo showing a polar bear standing face to face on different ice floes with an explorer holding a rifle. The scene was recreated on a Consolidated Ice Company parade float which was featured during a 1908 sesquicentennial celebration of Pittsburgh parade. 1911 Consolidated I Co. wagon on Diamond Street in downtown Pittsburgh. Sigmund Eckhaus was a dealer in china and house furnishings in Baltimore, Maryland. His company is found advertised as early as 1890 through 1920 in Baltimore newspapers and directories. It is believed he was born around 1865 of Jewish decent and married to Miss Carrie Reinach on October 30, 1889. The company was known primarily as an importer of china from Japan, and dealing in house furnishings and bric-a-brac. Chas. B. Edwards & Co.
Benedict Dorsey & Sons established a china and glassware house in Philadelphia in 1815. The company later operated under a number of different names including; Kaub, Fymier, & Edwards, Frymier & Edwards, Charles B. Edwards & Co., Earl S. Edwards, and the Edwards China Company. Charles Bockius Edwards became the president of the company and renamed it Charles B. Edwards & Co. during the late 1890s. Following his death in 1908, his son Earl Sallada Edwards took over and renamed it the Edwards China Company. Following Earl's death, the company was passed to his daughter Gladys Edwards on March 13, 1936. It is uncertain for how long the company remained in operation prior to closing. c.1905 Chas. 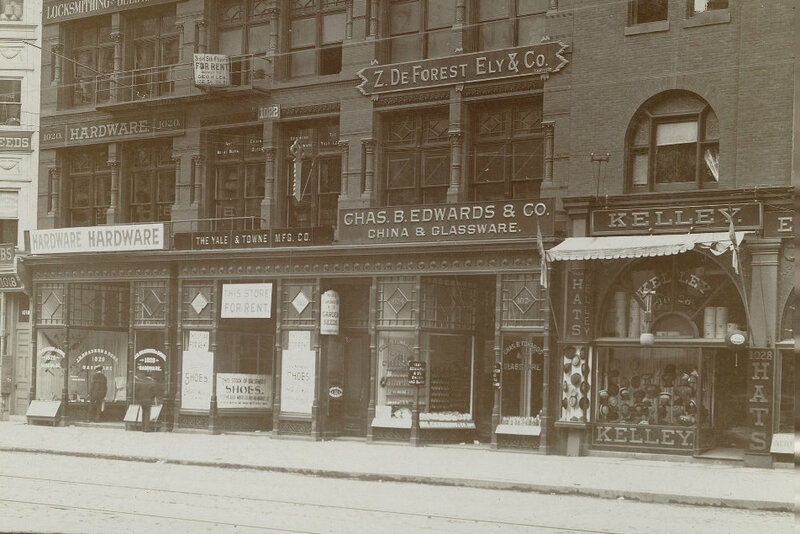 B. Edwards & Co.
Henry B. Howland opened a jewelry store in New Bedford, Connecticut around 1888. After 31 years in business, he retired in 1919. Little else is known about Howland or his jewelry store. 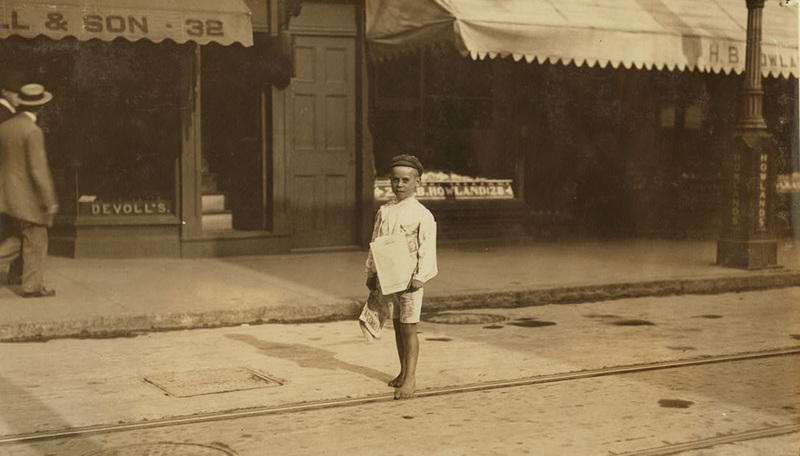 "John Sims, Newsboy" Photograph taken on August 22, 1911. H.B. Howland's store can be seen to the right of the boy. The Merchants Exchange of New Rochelle was an organization of local businesses trading in cash and futures products. It was located at 284 Main Street. Oscar P. Schlemmer who was born c.1860, was a resident and businessman in Hartford, Connecticut during the late 1800s and early 1900s. He is listed as operating a confectionary company at 143 Main Street. Little else is known about Schlemmer or his business. In 1856, Edward Campbell Simmons began a hardware business in St. Louis, dealing in hardware and sporting goods. In 1866, Simmons began to use the Keen Kutter trade name, which became synonymous with his hardware company. The Simmons Hardware Company was first used after its incorporation in 1873. By the early 1900s, the company had branches in Minneapolis, Soiux City, IA, Wichita, KS, Ogden, UT, Toledo, OH, and New York City. In 1940, the Shapleigh Hardware Company of St. Louis purchased the Simmons Hardware Company and acquired the Keen Kutter trademark. English-born Thomas G. Madoc arrived in Utica, New York from his homeland of Wales during the late 1870s taking a job at the State Hospital. Within six months of his arrival, he left the hospital and began working as a traveling salesman for Sherwood & Golden, a newly formed company in Utica that dealt in pottery and silver plated wares. Madoc was a proficient salesman and remained with the company for approximately 20 years. 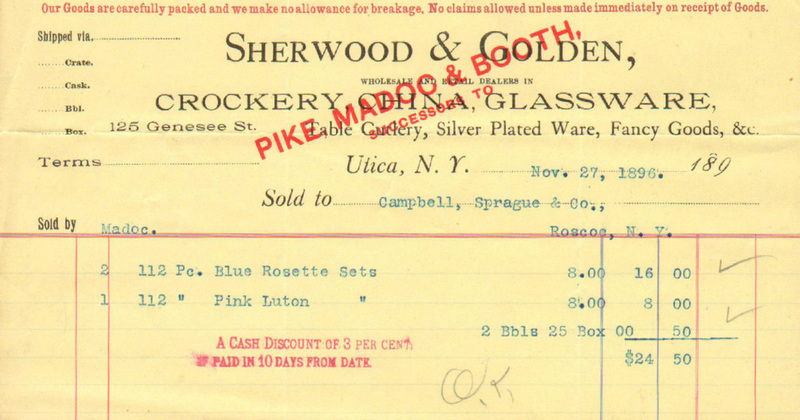 In 1896, he went into business on his own with former Sherwood & Golden associates Fred W. Pike and George W. Booth under the name Pike, Madoc, & Booth. The company was located at 125 Genesee Street and dealt in fine china, glassware, silverware, and other goods. As of April 1902, Booth left the company leaving Pike & Madoc running the business on their own. Then in 1904, Pike sold his interest in the company and relocated to Cleveland where he began work with Kinney & Levan (another firm dealing in the same line of business). Madoc, as sole proprietor, changed the name of Pike & Madoc in 1904 to Pike, Madoc, & Smith. It is believed that "Smith" represented Smith-Phillips China Company from Liverpool, Ohio. Pike & Madoc sold a line of pottery from Smith-Phillips which may explain the name change since no other "Smith" has been found in association with Pike & Madoc. 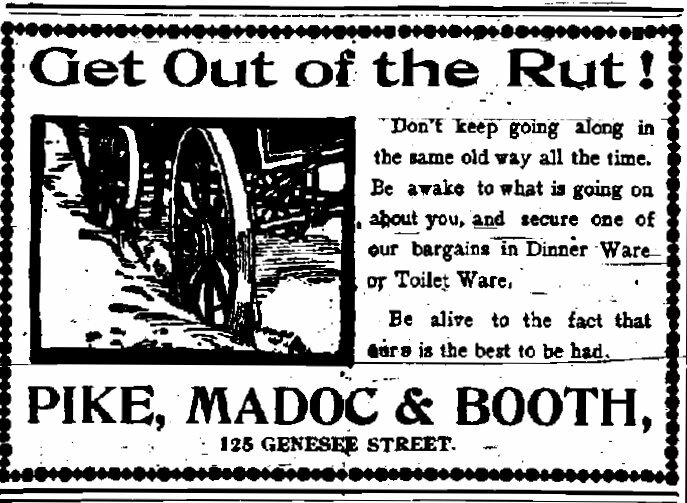 Madoc continued running the company until 1906, when the entire holdings of Pike & Madoc was sold voluntarily by Madoc in lieu of bankruptcy. In order to satisfy debtors, the company and its stock was sold at auction in 1906 to the Utica Crockery Company for $20,000. On April, 29, 1909, Madoc died unexpectedly following severe head injuries incurred after falling out of a "runaway" bus on his way to work one week prior.